Much less do we know what life is. Living things are made up of chemical machines. The secret of life, however, lies not in the correct combination of the chemicals of which living things are built. Science seeks to discover how life is imparted to otherwise dead matter, hoping to reverse the death process and thereby create eternal life. The right conglomeration of chemicals that moments before was alive is still intact, but no scientific process can restore the life that has left a corpse. That secret will never be found by examining living creatures because the life they have is not their own. We now know what Darwin never imagined, that life is based upon information encoded on DNA (See TBC Aug ’02). Indisputably, no information is originated by the medium in which it is communicated (printed page, audio- or videotape, DNA, etc.). Information can originate only from a conscious intelligence, a quality found only in personal beings. Clearly, the information that provides the instructions for constructing and operating the incredibly small and complex machines that make up living cells could only originate with an Intelligence beyond our capacity to comprehend. Jesus claimed to be the Source of life: “I am the resurrection, and the life” (Jn:11:25)—and He proved it by laying down His life and rising from the dead. He said, “No man taketh [my life] from me, but I lay it down of myself...and I have power to take it again...” (Jn:10:17,18). And so He did. There is, however, something more vital than physical life. Unquestionably, there is a nonphysical side to man. Words and the conceptual ideas they express (including those imprinted on DNA) are not a part of the dimensional, physical universe. The idea of “justice,” for example, has nothing to do with and cannot be described in terms of any of the five senses. It lies in another realm. Thoughts are not physical. They do not originate from matter nor do they occupy space. Our brains do not think, or we would be the prisoners of that few pounds of matter inside our craniums, waiting for the next orders it might give us. Man has not only physical but “intelligent” life. What could be its source? Of Jesus, John said, “In him was life; and the life was the light of men” (Jn:1:4). Christ declared, “I am the light of the world: he that followeth me shall not walk in darkness, but shall have the light of life” (Jn:8:12). The reference is not to physical light but to the spiritual light of truth—another abstract concept without any relationship to the physical universe. “Truth” takes us beyond animal life; it has no meaning for animals. Their “intelligence” knows nothing of love, morals, compassion, mercy, or understanding but is confined to instinct and conditioned responses to stimuli. B. F. Skinner tried to fit man into the same mold, but our ability to form conceptual ideas and express them in speech cannot be explained in terms of stimulus/response reactions. There is an impassable chasm between man and animals. Intelligence is nonphysical because it conceives of and uses nonphysical constructs that clearly do not originate with the material of the brain or body. This takes us beyond the physical universe into the realm of spirit. We do not know what a soul or a spirit is, or what it means that God “is a Spirit” (Jn:4:24) who “created man in his own image” (Gn 1:27). God has given us sufficient proof in what we can verify to cause us to trust completely whatever His Word declares concerning things we cannot fully comprehend. That is where faith enters. There is much that, although we cannot understand it, we know is true. This is the case, for example, with the fact that God is without beginning or end. It boggles our minds, but we know it must be. While seeking to unravel the secrets of the universe, science neglects its Creator. The universe can lead man only to a dead end, since ultimate knowledge is hidden in the God who brought all into existence. Though not idol worshipers in the primitive sense, scientists, university professors, business executives, and political leaders, no matter how brilliant, who do not know Christ fit the description in Romans 1 of those who reject the witness of the universe and worship the creation instead of the Creator. It is possible for Christians also to be caught up in this same materialistic ambition and to miss what God offers us in Himself . Paul’s earnest desire was that all believers might attain unto “the full assurance of understanding, to the acknowledgement of the mystery of God, and of the Father, and of Christ; in whom are hid all the treasures of wisdom and knowledge” (Col:2:2,3). Our knowledge of both the physical and spiritual is limited at best. But one day we will fully know when we are with Christ in our glorified bodies: “For now we see through a glass, darkly; but then face to face: now I know in part; but then shall I know even as also I am known” (1 Cor:13:12). When in His presence we wholly know Christ as He truly is, all limitations will have vanished, even our lack of power to fully overcome sin: when we see him, “we shall be like him; for we shall see him as he is” (1 Jn:3:2). Knowing Christ is everything! Secular knowledge pursued in our universities looks in the wrong direction. The treasures of wisdom and knowledge hidden in Christ can never be discovered by scientific inquiry but can only be revealed by His Spirit through His Word to those who believe in Him. The concept of one true God who exists eternally in three Persons (Father, Son and Holy Spirit) is rejected even by some who claim to be Christians. Yet this is taught all through Scripture, in the Old Testament as well as in the New. Consider: “I have not spoken in secret from the beginning; from the time that it was, there am I....” Surely the speaker who has been in existence forever must be God himself. Yet He declares, “the Lord God, and his Spirit, hath sent me” (Is 48:16). We cannot comprehend the mystery of the Trinity; yet that is no more reason to doubt it than to doubt anything else that we know is real but cannot comprehend. If God were a single being (as Muslims believe Allah to be and most Jews believe Yahweh is), He would have had to create creatures in order to experience love, fellowship and communion. The biblical God is love in Himself, manifesting plurality in the Godhead: “The Father loveth the Son...” (Jn:5:20). God must be one; but He must comprise both singularity and plurality. Only God could pay the infinite penalty His justice demands for sin. But that would not be just, because “God is not a man...” (Nm 23:19). The incarnation is therefore essential—but impossible if God were a singular being. “The Father sent the Son to be the Saviour of the world” (1 Jn:4:14). It was Jesus who died on the cross, not the Father nor the Holy Spirit. Neither could a mere man, being finite, pay that infinite penalty. All through the Old Testament, Yahweh declares that He is the only Savior (Is 43:3,11; 45:15,21; 49:26; Hos:13:4, etc.). Thus Jesus had to be Yahweh but also a man. When God the Son became a man He did not and could not cease to be God. Jesus was both God and man. How could God become a man? Again that is only possible through the Trinity. The Father didn’t become man, nor did the Holy Spirit. Even though we cannot understand this, we know it must be so. The penalty for our sins is infinite because God and His justice are infinite. Consequently, those who reject Christ’s payment on their behalf will be separated from God forever. How evil could arise in God’s “good” universe (Gn 1:31) is a mystery—“the mystery of iniquity” (2 Thes:2:7). It will reach its fullness in Antichrist through whom Satan will rule the world. In Antichrist, Satan will be manifest in the flesh, as God was, and is, in Christ. Satan must be brilliant beyond our comprehension, apparently second only to God in power and understanding. It is a mystery that Satan, having known intimately the holy and glorious presence and power of God on His throne, could ever have dared, much less desired, to rebel. How could he have imagined that he could ever defeat God? Surely this is a great mystery! Satan was not raised in a “dysfunctional family” or in a ghetto, nor was he “abused as a child.” None of the standard excuses for rebellious and selfish behavior accepted by today’s Christian psychologists applies to Satan—or to Adam and Eve. To accept any explanation for evil that doesn’t fit them is to be deceived. Certainly today’s popular diagnosis of “low self-esteem” or a “poor self-image” was not Satan’s problem! Scripture says he was lifted up with pride: “O covering cherub....Thine heart was lifted up because of thy beauty, thou hast corrupted thy wisdom by reason of thy brightness” (Ezk 28:16-17). He is apparently a self-deceived ego-maniac, blinded by pride in his own power and abilities. Here is the mystery of iniquity: In the very presence of God, in the heart of the cherub closest to God, the ultimate evil was conceived. By one fateful choice, the most beautiful, powerful, and intelligent angelic being became for all time the ultimate in evil: the arch enemy of God and man, the “great dragon...that old serpent, called the Devil, and Satan, which deceiveth the whole world” (Rv 12:9; 20:2). Paul warns that a man should not become an elder until he is mature in the faith, “Not a novice, lest being lifted up with pride he fall into the condemnation of the devil” (1 Tm 3:6). This tells us again that pride was Satan’s downfall—and is man’s besetting sin as well. “Pride goeth before destruction, and an haughty spirit before a fall” (Prv 16:18). It is also a mystery that Eve would believe the serpent’s lie contradicting what her gracious Creator had said. Adam was not deceived (1 Tm 2:14). No doubt out of love for Eve and not wanting to be separated from her, he joined her in disobedience, knowing the consequences. It remains a mystery, however, that anyone would rebel against God, that anyone would choose the pleasures of the moment in exchange for eternal separation from God. The heart of this mystery is the autonomy of intelligent created beings who clearly have something called self-will. At least some angels (Satan and those who joined his rebellion) and all men have the power of choice. In deciding upon beliefs or actions, though evidence may be weighed, ultimately reason is set aside in order to bow before the throne of self. We are our own worst enemies. Self had its awful birth when Eve made the choice of disobedience for all of her descendants. Christ said there is no hope except we deny self (Mt 16:24). And the only way that can be done effectively is to embrace the cross of Christ as our own so that we can say with Paul, “I am crucified with Christ: nevertheless I live; yet not I, but Christ liveth in me...” (Gal:2:20). 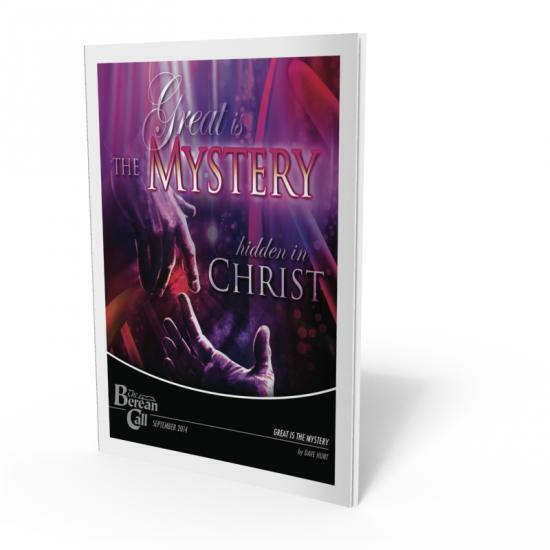 The solution to evil through the incarnation is also a mystery: “...great is the mystery of godliness: God was manifest in the flesh, justified in the Spirit, seen of angels, preached unto the Gentiles, believed on in the world, received up into glory” (1 Tm 3:16). “ God was manifest in the flesh .” What a mystery! God could become a fetus in Mary’s womb? John the Baptist as a 6-month-old fetus leapt in the womb of Elizabeth in recognition that Mary was pregnant with the Messiah. Amazing! “ Seen of angels .” These heavenly beings must have watched in astonishment. The One whom they had known as God the Son, one with the Father, for at least 4,000 years by earth time (we know not how much earlier angels were created), was growing in the virgin Mary’s womb, soon to be born a babe needing a mother’s milk and care—truly man, yet at the same time truly God. Mystery of mysteries! “ Believed on in the world .” The Apostle John speaks in awe of this One whom “we have heard...seen with our eyes...looked upon, and our hands have handled, of the Word of life; (for the life was manifested, and we have seen it, and bear witness, and show unto you that eternal life, which was with the Father, and was manifested unto us)” (1 Jn:1:1,2). In his Gospel John says, “The Word was made flesh, and dwelt among us, (and we beheld his glory, the glory as of the only begotten of the Father,) full of grace and truth” (Jn:1:14). Yes, “ Believed on in the world .” Certainly John believed, as did Paul, that Jesus the Messiah of Israel was truly “God manifest in the flesh.” To be a Christian one must believe that Jesus Christ is God come as a man to redeem us. What love to come from so high to stoop so low—to be rejected, hated, misunderstood, mocked, maligned, stripped, scourged, and crucified by those He came to redeem! “ Received up into glory .” His sacrifice accepted by the Father, He is glorified at the Father’s right hand and interceding there for us (Rom:8:34). But even before that great meeting in His presence in the Father’s house, “beholding as in a glass the glory of the Lord, [we] are changed into the same image...by the Spirit of the Lord” (2 Cor:3:18). Surely if the incarnation is the great mystery of godliness, then for us to live godly lives we must have Christ dwelling within us and living His life through us: “Christ in you, the hope of glory: whom we preach...” (Col:1:27, 28). This is the “hope of his calling” which Paul prayed that the Ephesian saints would understand. Peter explains that God “hath called us unto his eternal glory” (1 Pt 5:10). We are going to be like Christ. The glory that the disciples beheld in Christ will be manifested in us!